Surprise! It’s Monday, and a snowstorm hit New England. That hasn’t happened since … hmmm, when was it? Ah yes, now I remember: Last Monday (and the one before that). If you are in the mood to read about protagonists who are also dealing with loads of snow, here are seven books that reflect our current weather (to one, ahem, "degree" or another). "Dr. Zhivago" by Boris Pasternak. The story of how the 1957 novel found its audience (an Italian publisher smuggled it out of the Soviet Union) is almost as intriguing as the novel itself. Almost. It follows Yuri Zhivago from the waning days of the Romanov Empire through World War I and the Bolshevik Revolution, featuring many a winter scene along the way. “Ethan Frome” by Edith Wharton. During a bleak New England winter in the town of Starkfield that provides copious opportunities to reflect mood through descriptions of the weather, Ethan Frome falls in love with his sickly wife’s beautiful cousin. They take an ill-fated sled ride, and tragedy (times a million billions) ensues. "Anna Karenina" by Leo Tolstoy. Who can forget the scene of Anna Karenina throwing herself under a train on a snow-dusted night? "Where'd You Go, Bernadette" by Maria Semple. Semple's witty, poignant book may have been largely set in Seattle, but her young protagonist goes all the way to the snowy landscape of Antarctica in search of her mother. "The Lion, the Witch, and the Wardrobe" by C. S. Lewis. From the World War II country home where Peter, Susan, Edmund, and Lucy are spirited to escape the London Blitz, the four siblings enter the fairy winterscape of Narnia, iced over by the White Witch and waiting for a hero (or four) to lift the spell. "Between Shades of Gray" by Ruta Sepetys. In this heartbreaking but important novel, which tells an often-neglected tragedy of history, 15-year old Lina and her family are expelled from their home in Lithuania and sent through Belarus and the Ural Mountains, across the Arctic Circle to the North Pole. “Bellweather Rhapsody” by Kate Racculia. As a snowstorm bears down on upstate New York, 200 high school musicians converge on a fading resort hotel for a music festival. The rollicking adventure of a novel features shocking reveals, mayhem, highjinks, and a very dramatic scene in a snow bank. “Greenglass House” by Kate Milford. I just downloaded this book today, so I can’t recommend it from personal experience. But it’s the 2015 Edgar Award Nominee for Best Juvenile Mystery, features a snow-covered mansion on the cover, and takes place during a winter holiday. 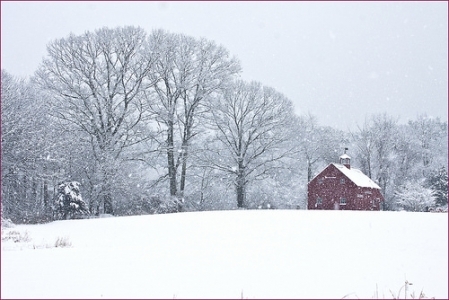 What are your favorite snow scenes in literature?